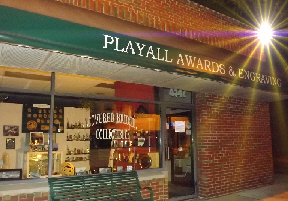 Since 1993 PlayAll Awards & Engraving has been working with Corporations, Industry Leaders, Educators, Coach’s, Service Clubs, Civic Organizations and Individuals just like You, who know the Importance of Recognition be it Designer Plaques, European Trophy Cups or just the thrill of wearing a good looking medal . We use the latest in technology, complete with laser engravers, digital imaging and computerized engraving. From the traditional 6″ little league award to a 6′ Motor Cross trophy, when it comes to awards, we really do them all at PlayAll. Looking to save $$$, and maybe even something for free??? Check out our Specials page for great discounts. We provide a full line of Acrylics, Desk Accessories, Corporate Recognition Items, Plaques, Sports Awards, and Medallions. Please click logo to see what they have to offer.